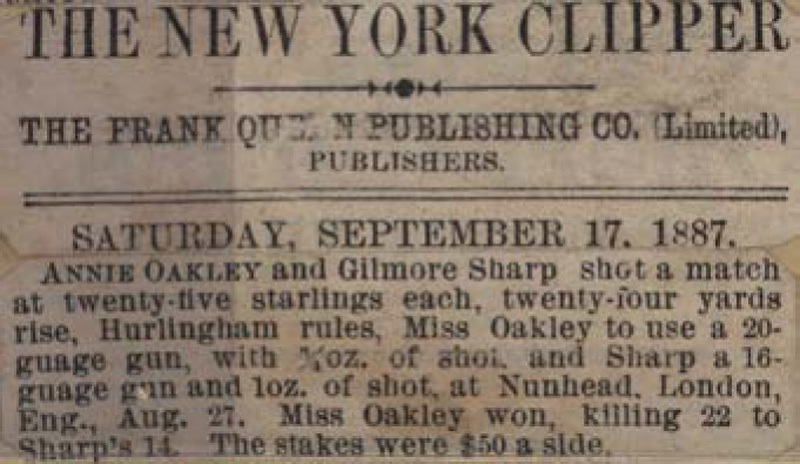 ANNIE OAKLEY and Gilmore Sharp shot a match at twenty-five starlings each, twenty-four yards rise, Hurlingham rules, Miss Oakley to use a 20-guage gun, with 3/4 oz. of shot. and Sharp a 16-guage gun and 1oz. of shot, at Nunhead, London, Eng., Aug. 27. Miss Oakley won, killing 22 to Sharp's 14. The stakes were $50 a side.